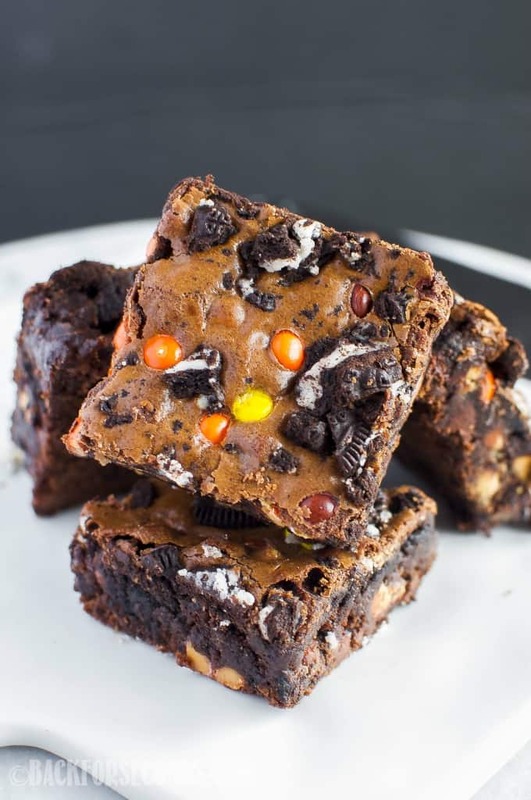 Hands down, my favorite dessert is a thick, fudgy brownie. Homemade brownies are seriously simple to make, and they are so fun to jazz up with your favorite mix ins! 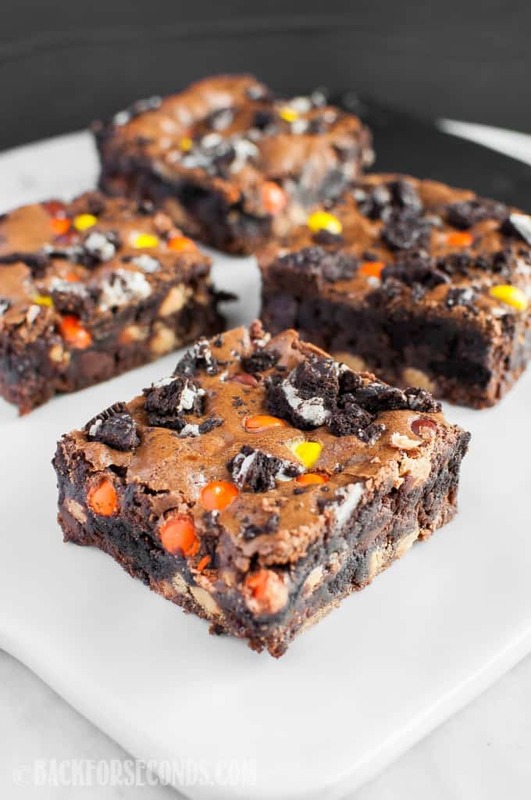 This time we went with Oreos and Reese’s Pieces. They turned out amazing with fudgy centers and crackly tops, and the colors are perfect for Halloween! Now that my three older kids are in school, my 3 year old and 1 year old have taken over as my main assistant bakers. My 3 year old asks several times a day is we can make something together. He can even pretty much recite recipes when I ask what he wants to make! It’s pretty impressive! My 1 year old has to get in on the action too. He loves pouring sugar and flour into the bowl, and he always wants to crack the eggs…he hasn’t learned how to do it gently yet. We’re working on it 😉 He even tries to wash the dishes for me. He will play in the sink with soapy water and dirty dishes for hours! I just want them to stay little forever. Baking with them is so much fun – we’re making lots of memories! 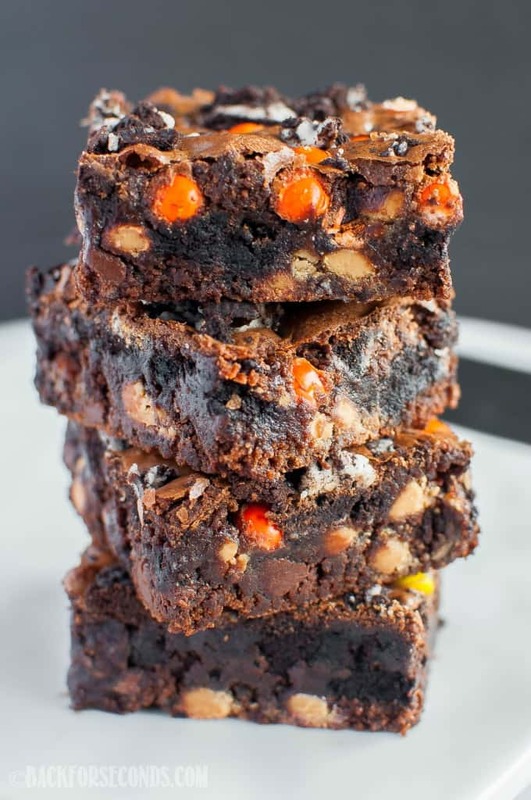 Anyway, all this to say – you should totally make these brownies! I promise you won’t be sorry. Enjoy!